Many of us have to work full-time in order to earn a living, and it is common to have to travel to do so, whether this is by car or public transport. With early wake-up alarms and chores to do when we reach home, working and traveling can result in feeling too tired or drained to do any other worship aside from what is compulsory. So how can we use the different parts of our working day to connect with Allah ? We work because we need to earn money, and we -hopefully- love doing the work we do. But for the Muslim, there is more than the “eat, sleep, work, repeat” cycle, because we are constantly thinking of our Hereafter too. So to make sure we keep the connection between our work and spirituality, here are four tips to ensure you can always incorporate the remembrance of Allah in your daily working life. Instead of scrolling through your Facebook or Instagram feed whilst waiting for your train or bus to arrive, or listening to radio or music whilst driving, use this valuable time to connect with Allah by learning something new or remind yourself about aspects of the deen. There is a plethora of content on the internet that we can use to gain beneficial knowledge and I find that listening to beneficial talks by respected scholars or teachers is the best method of learning whilst on the go. The majority of us have smartphones, so it’s a simple matter of putting these devices to good use. A quick means of extracting useful knowledge is also to use sites that are easily accessible, and free to use. Choose a subject title that interests you and that lasts for approximately the same time as your journey. I usually choose a 30-minute talk to match my commute time or a couple of talks that last 15 minutes each and download from YouTube using a video converter. Alternatively, websites also have free talks that are ready to download. A great and easy resource for on-the-go knowledge is the Podcasts app. It is best to prepare for the commute for the working week ahead, so I usually use the above technique to download five beneficial talks every Sunday evening, ready for my upcoming travels to work. An interesting point to note is that I keep a lot of the content that is especially relevant to me on my device, rather than deleting them once I have listened to it. I repeat the speeches again during a commute on another day in order to reinforce the lessons, until I have incorporated what I have learned into my actions. I also like to use different methods of taking in knowledge to add variety to my learning, which helps me to maintain motivation to be. If you are sitting on the train or a bus, read a beneficial book on the way home; some ideas are, Yasmin Mogahed’s ‘Reclaim Your Heart’ or a factual biography of an influential Muslim, like the seerah of Prophet Muhammad , or Malcolm X or Muhammad Ali. I recommend investing in an e-reader like a Kindle, so you can carry multiple books on one device, giving you the option of reading any book depending on your mood without having to carry extra weight. Books to download on e-readers also tend to be cheaper than hard copies, and you won’t waste space in your house storing these copies. However, there are those who prefer to hold physical books and turn the pages, so choose whatever you prefer. What is important is that you don’t waste this precious time, and once you start walking home, and are unable to continue to read, use this time to recite the part of the Qur’an you are attempting to memorize. Or, switch to your phone, plug in your earphones and listen to recitation of the Qur’an from your favorite reciter, or finish the talk from the morning if you haven’t already done so. Dhikr (or remembrance of Allah ) is an easy act, with high reward. Imagine using a one-hour drive or commute for making istighfar (seeking forgiveness), whilst knowing that istighfar increases provision (rizq) and causes sins to be forgiven. Or, how about spending that time sending repeated salah and salam on Prophet Muhammad , when you know that it causes your needs to be met? From this ayah and hadith, it is clear that dhikr will have a huge impact on your work and the barakah that comes from it. During the busy working day, it is easy to forget our main purpose is to worship Allah , even while we are striving to earn money and support our families. Incorporating dhikr whilst knowing its reward will make your working day so much more meaningful. For those of us lucky enough to have a lunch break, this is a precious hour not to be wasted. Most of us spend the entire hour eating whilst chatting to colleagues about last night’s TV show or something of that sort. Whilst I believe that interacting with colleagues is important, our lunch break should be spent more wisely and should be used to incorporate more dhikr. Once you’ve prayed your afternoon salah, take a few minutes to recite Qur’an, whether from a small mushaf or an app on your phone. It is so important to incorporate recitation into your day and I feel that the afternoon break is the perfect time to step away from the busy surroundings, re-center ourselves and be reminded of our purpose. I like to use the hard copy but I do not carry a Qur’an with me to work. Instead, I use the Qur’an provided in the prayer room at work or an app, which bookmarks my place. I then adjust it based on what I have read at home and at work, so I am able to track my progress. The rest of the hour can be used to nourish yourself, whilst spending time talking to people. Talk about beneficial matters, bounce ideas off of each other, learn more from your colleagues to help you grow and develop. If you do not work with people, read a beneficial book or articles from your favorite website – for example, you could check out the latest article on Productive Muslim! You’ve just had an exhausting day at work, so it is time to give your mind a break. Although it may be tempting to shut yourself in your room and watch Netflix to relax, a better and more favorable way to unwind is to spend time with family or friends. Spend some time playing a board game with your younger siblings; help your mum or spouse out by clearing the table, or bake a cake with your family for your co-workers. Have a conversation with each other about how your days were, or teach them something new that you have learned from the knowledge you have gained that day. It is said that if Shaitan can’t make you fall into sin, he’ll make you waste your time. It is so easy to lie down on the sofa in the evening for 2 or 3 hours after work watching TV to unwind. You could end up wasting up to 20 hours a week staring into space, not stimulating your mind! If possible, take a couple of hours a week instead to attend a class that teaches Arabic or tajweed at your local mosque. I understand that not all of us live in an area that offers beneficial classes, or some of us do not have the funds to be able to do this, and that’s fine! There are plenty of other ways to spend those precious hours you have in the evening. Luckily, we are blessed to have the technology to make our lives more convenient – what we should not do is waste that extra time being entertained by posts on Facebook or videos on YouTube. We are so lucky to live in a digital age where information is right at our fingertips. If you want to learn Arabic, for example, there are plenty of websites that will help you learn the language for free, such as learnarabic.info, with free books to download. There are useful apps that you can use to track your progress such as ‘Habit Tracker’ that you can use to encourage you to develop an activity into a habit. For example, reading one chapter of an Arabic textbook or memorizing part of a surah could be goals that you try to achieve a few evenings a week. You choose what you want to learn in these few hours in the evening, but what is important is that you do not waste this time. It is also important to sleep early after the evening salah. Avoid spending time on social media late at night, which is often another tool people use to unwind that can easily eat into the precious time we have outside of work. Another important act to incorporate during the night is qiyaam (night prayer). It is a common misconception, that night prayer is only prayed in the depths of the night whilst everyone is sleeping. This, however, is just one way to pray the night prayer, and actually, qiyaam can also be prayed right after Isha prayer before you sleep, or before Fajr begins. It carries immense reward, and we really have no excuse for missing it because it can be as little as two raka’ah. So, practically speaking, Surah al Fatihah has seven verses. Add a short surah like An-Naas, or Al-Falaq and there you have your ten verses, and you won’t be recorded amongst the negligent! Work is a necessary activity for most of us; it takes up the majority of time in our day, but, this does not have to mean that you miss out on gaining spiritual rewards and seeking the closeness of Allah . It is so important that the time we have outside of work is spent learning about our deen and attempting to perfect our practice as followers of Islam. 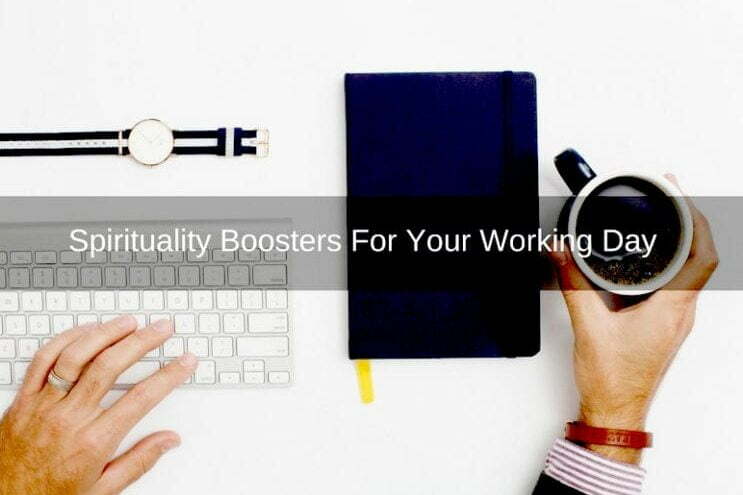 The tips above are only a few of the ways to include spiritual nourishment into our busy work life. Now tell us, how do you remain connected to Allah whilst working? Share your tips in the comments section below! Shaheen Munshi is a full-time working Muslimah, who works as a pharmacist in a busy London hospital. She is also training to become a web developer in her spare time. Writing is a passion of hers and she is currently working on her first book.